There seems to be a lot of people who say positive opinions about gold mining stocks. They present various reasons. Their expectations may be right. However, it seems not yet. 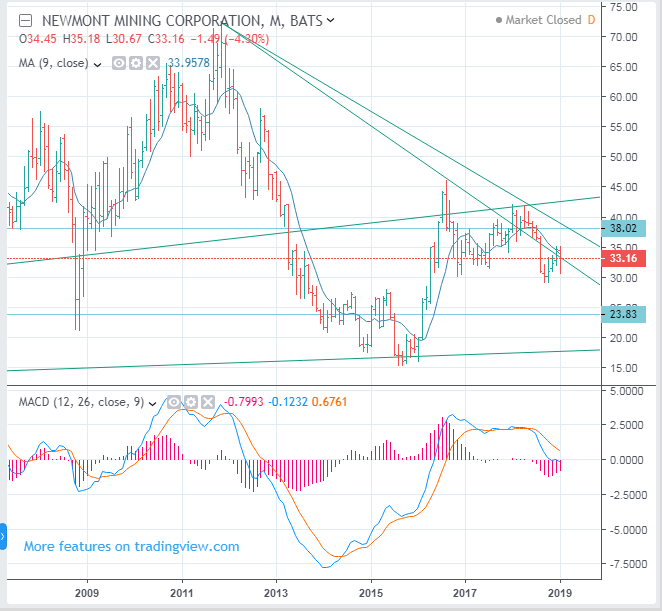 The chart below is a monthly graph of Newmont Mining stock prices. Newmont has attracted the attention of people these days. If it goes up, its resistance line will be $ 38. Its support line seems to be $ 23.83. People who like gold mining stocks will not accept it, but I think gold mining stocks will fall. It seems that it is not time to buy gold mine stocks. If they establish their bottoms safely, then, it's better to get into the market.